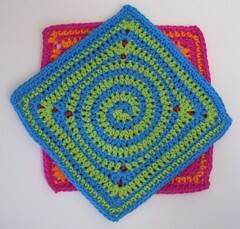 This is a *crochet pattern* in .pdf format (and U.S. notation) for making one of the dishcloths pictured. You’ll also need three quarters of an ounce of each of two different colors of a worsted weight cotton yarn (for 1.5 ounces total), a size H (5.00 mm) crochet hook, and a tapestry needle for weaving in your ends. The finished cloth is approximately 7.5 inches (19 cm) square. provoke in visitors to your profile which in turn will result in your profile attracting more followers. How cool–not just a spiral but a round-to-square shape, too! Thanks for offering the pattern–this is now on my to-make list. I have some golden yellow and denim blue in my stash that would work together nicely….